Daily Illuminator: Revolution! Video Is Live! 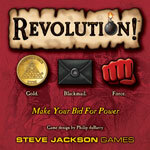 March 12, 2013: Revolution! Video Is Live! Our talented Webmaster, Alex Kosarek, has cooked up a new video, this time for Revolution!, our competitive bidding game of bluff, counter-bluff, and surprise.